Traditions and customs of Moroccan style design have deep roots, but it easily could be used in a modern interior. Exotic patterns, stunning colors and a sense of adventure inherent in the Moroccan style, and it can turn the bedroom into the world of luxury and splendor. Purple and lilac – two colors that have become especially popular in the last decade. Any of these shades and tones give the interior a different vibrant style and elegance. 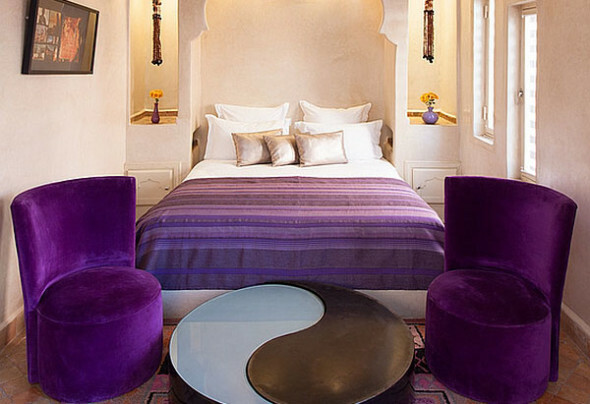 Moroccan bedroom in violet tones look natural, exotic and luxurious. If you want to turn your bedroom in a romantic nest, then choose the Moroccan style. Amazing red and gorgeous scarlet – integral part of multi-colored oriental interior. 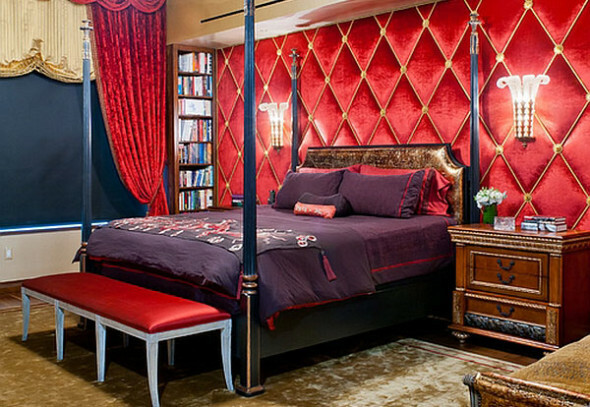 Their combination with a velvety texture will allow you to arrange an amazing bedroom. Canopy bed will add a mystical charm to the room, and bright wall will only reinforce the effect. If you do not want to do the whole interior in red tones, you should not forget about the delicate pink and hot orange colors. They also wonderfully fit in Moroccan style. 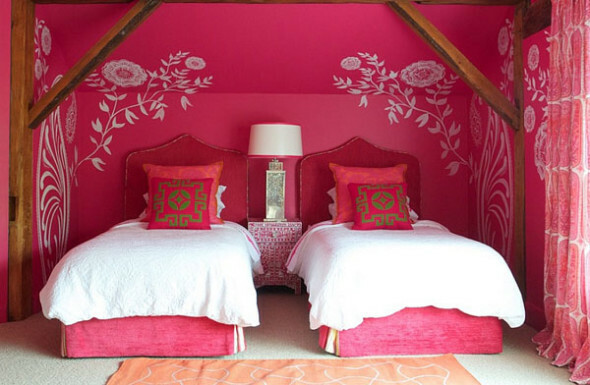 Another opportunity to draw bedroom in Moroccan motifs, not strictly adhering to the theme. 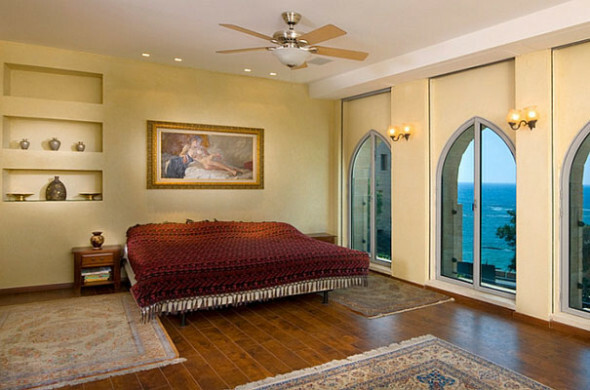 This Mediterranean style, which allows you to fill the bedroom special relaxing atmosphere. Moroccan style and culture is deeply related to a Middle Eastern and Arab cultures, so easily and naturally in the interior will mix them with Mediterranean motifs. Cute lanterns, carved panels Mashraba original windows – allows you to combine all the styles in the same room. In addition, you can choose a neutral background and décor without intricate patterns. The first thing that comes to mind at the mention of the interior in the Moroccan style – it’s amazing ornaments, as if descended from the villages of fairy tales. And although the issue such a room it is possible, most prefers bedroom less exotic. 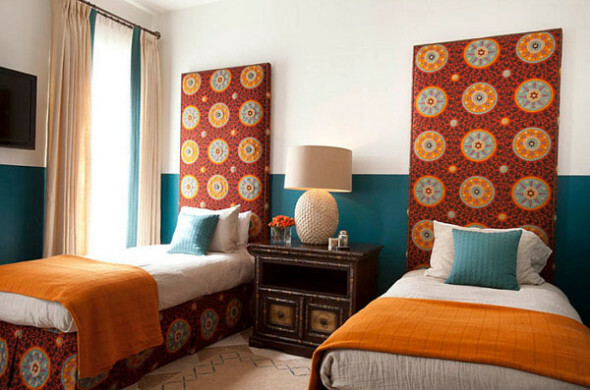 Modern Moroccan style – perfect harmony between a neutral background and décor in traditional motifs. Lighting – one of the main elements that determines the overall atmosphere, and rugs, ottomans and colorful geometric patterns complete the look. To create a unique eclectic bedroom design can also try to combine several styles. 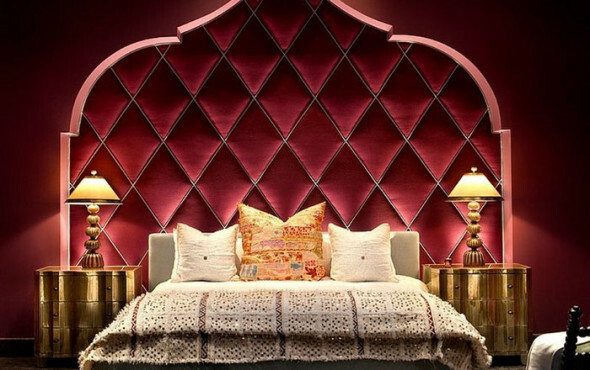 Bright colors, intricate patterns, it seems, are simply created for a bedroom in a bohemian style, which plunged into a clearly thought-out mess. Opposite it will look like the interior in which you want to add a mirror surface and take a bold color scheme. Get a Hollywood style with Moroccan tunes. When it comes to the design of the bedroom, many people forget that the whole secret, really, in the bed, that it ends with the last day. 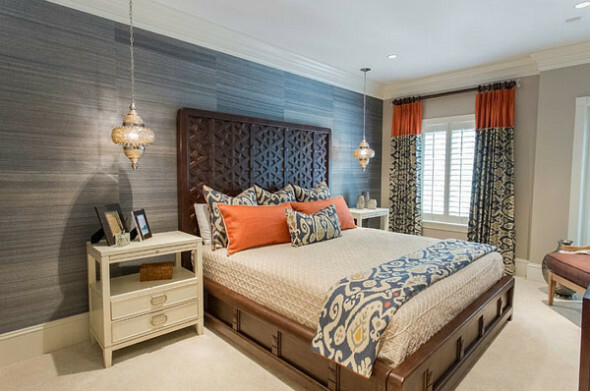 The easiest way to decorate a room in a Moroccan style – turn the bed in the center of the composite. Traditional architectural details and furniture ornamented only make this task easier. In addition to the canopy, can be equipped with the original headboard, consider lighting, and then the bed will be a stunning interior decoration.